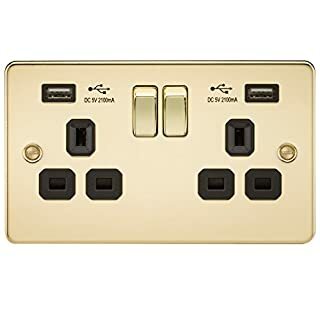 The Masterplug Indoor Power surge-protected extension lead allows you to protect your sensitive electronic equipment against the damaging effects of surges and spikes. 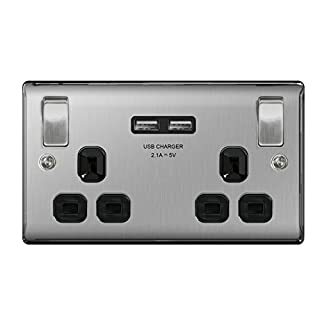 This is a wi-fi booster that is built into a UK double power socket and also have a 2.1A USB charging socket. 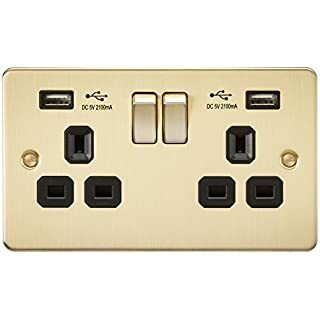 Installation is not complicated You simply replace a double socket in the place where you are having a wi-fi reception issue with this one. 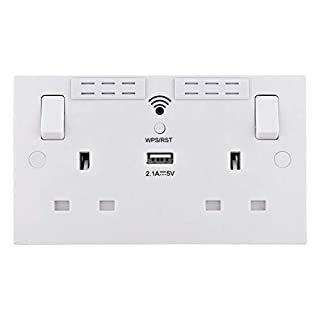 The wi-fi booster will work with all makes of wireless broadband router and can be linked with the touch of a button (the WPS button on the front of the unit). The booster incorporates N300 Wi-Fi Technology giving up to 300Mbps data transfer speed. Great for streaming video, music etc. Use to extend you wi-fi to garden rooms, extensions, attic rooms etc. 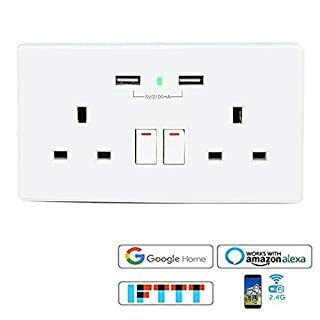 The 2.1A USB charging socket is ideal for charging mobile phones, tablet computers, cameras etc. 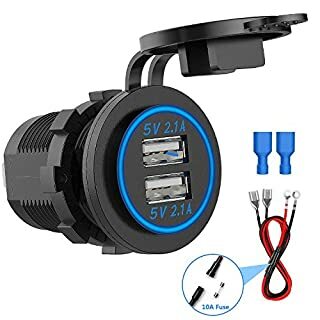 Description: This wall mounted USB power socket is used to supply power for smart phone, camera and digital products. 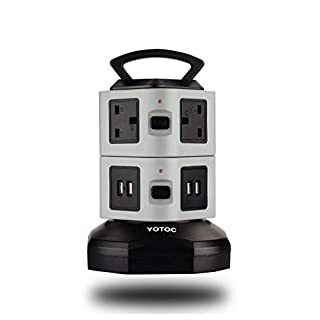 4 USB ports bring much convenience of charging. 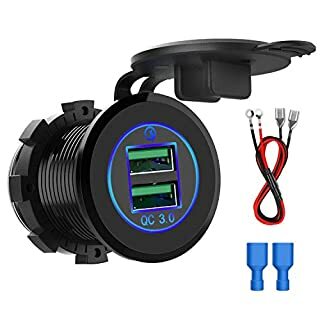 It features highly safe and fast charging speed, widely used for home, office, hotel and public places. Specifications: Condition: 100% Brand New Material: PC + Tin-phosphor Bronze Color: White Input Voltage: AC 220~250V USB Output: DC 5V Max. 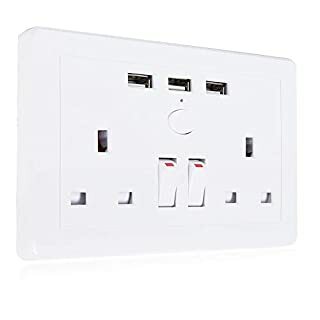 Output Current: 4100mA USB Ports Number: 4 Size(L x W x T): approx. 8.6 x 8.6 x 4cm / 3.39 x 3.39 x 1.57inch Weight: approx. 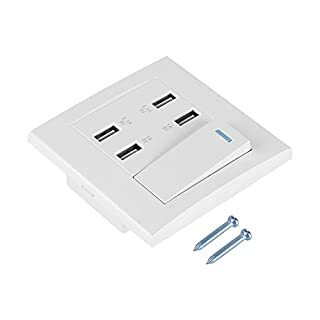 116g Package Included: 1 x USB Wall Mounted Socket 2 x Screws Note: 1. Please allow 0-2cm error due to manual measurement. Thanks for your understanding. 2. Monitors are not calibrated same, item color displayed in photos may be showing slightly different from the real object. Please take the real one as standard. 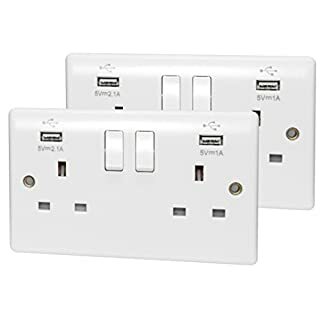 Mega Socket 2 gang swicthed double USB & UK PLUG wall socket in white finish, elegant and trendy design. Suitable for indoor installation. Made with high quality materials for maximum performance and durability. 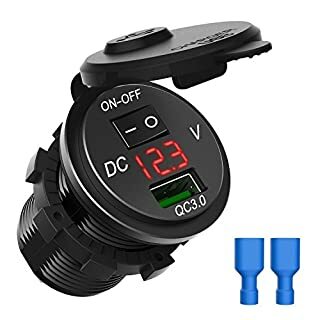 13A 250v, CE. 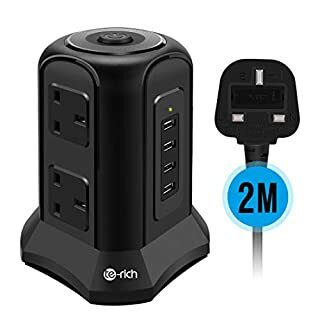 Dual QC3.0 USB Fast Charger QC3.0 USB port is is 4x faster than conventional chargers. Backwards compatible with Quick Charge 2.0 & 1.0. Suitable for all popular USB devices. 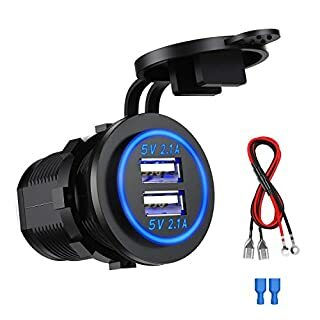 Save your charging time perfectly. 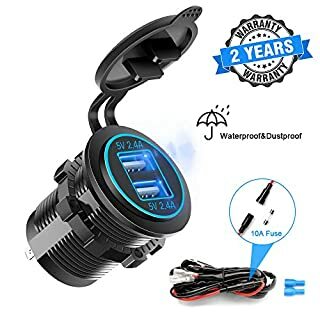 Waterproof and Fireproof Unlike others nylon material, the outlook of dual charger socket is IP66 waterproof grade and adopted for aluminum alloy which can guarantee long-term use without overheat. Smart IC Technology With intelligent power IC, outputs stable current without fluctuation. 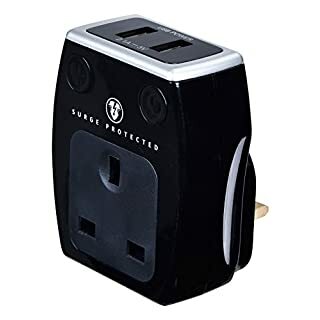 Six Safer Protections for Digital Devices 1.Overcharge protection Prevent overcharging of digital devices 2.Overload protection Prevent overload when digital power equipment is full power. 3.Overcurrent protection Preventing instantaneous large current from burning digital equipment 4.Overtemperature protection Automatic protection when temperature is too high 5.Undervoltage protection Prevent low voltage usage of digital devices 6.Short circuit protection Short circuit automatic protection Specifications Input: DC 12V-24V Output of each usb port: DC 3.6-6.5V/3A, 6.5V-9V/2A, 9V-12V/1.5A Max Output: 36W Product Dimension: 4.9cm x 3.7cm (1.9in x 1.45in) Portiforium Dimension: 2.9cm (1.14in) Package Include 1 x Dual USB Car Charger Adapter 2 x Blue Connection Cap 1 x 23.7 Inches Wire with 10A fuse Notes: 1. Some mobile phones do not support fast charging, such as the iPhone series. It will adapt for normal charging speed automatically. 2. For mobile phones that support fast charging, you must use the original charging cable or fast charging cable to achieve fast charging. 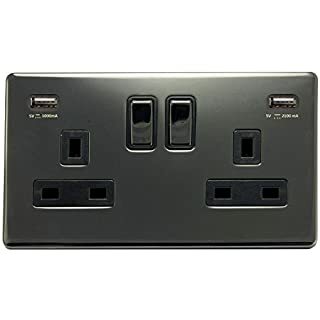 3 USB charging ports, 2 AC sockets, with strong compatibility, a charging socket to get a variety of devices such as mobile phone cameras. Each AC port is equipped with an independent switch. 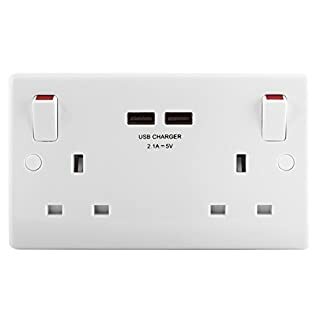 USB charging ports also has an independent switch. When the device is used up, press the switch to cut off the power directly. No need to pull the plug. 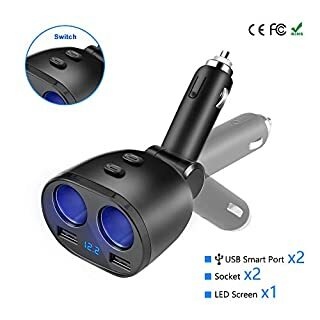 Ideal For Use With Iphones Smartphones And Other USB Devices. The AC port safety door is designed to prevent children from touching the electric shock.